A vintage-themed wave full of easy to reuse, all-star Marvel characters in Toy Biz stylized packaging; I’d be concerned if Spider-Man wasn’t a part of it. Spider-Man is a staple of the Marvel universe, so of course he’d make it into the Hasbro Marvel Legends Vintage wave along with Punisher, Black Widow, Iron Man, Captain America, Black Widow, and Wolverine. I’ll probably never get tired of this Spider-Man mold getting reissued. Besides maybe a few tiny refinements like slightly more hip range-of-motion, it’s just about the perfect $20 action figure. So what makes this Spider-Man different than all of the others? The new paint job is nice, I may actually like it more than the original Pizza Spider-Man release. They used a more matte approach instead of the original’s glossy finish. On top of that, the Spider-Man logos on both his chest and back are different than previous Spider-Men. Finally, the pizza slice’s pepperonis are painted to look like sausage. More food accessory options are always good. There is no new sculpting on this figure, but interestingly enough, the pegs on his wrists do not match the original release. Basically, this means you can’t use any of those hands with this figure. Normally that wouldn’t really be an issue, but they kind of skimped out on the extra hands with this release. How vintage of them! I seem to have some hands with the new peg and some with the old floating around in my accessory bin. The problem is that I’m not entirely sure which Spider-Man any of these go to. I believe some of the teen-sized Spider-Men used the larger sized hands as well, so they probably snuck into the pile. Oh, and they still haven’t fixed visible bright red pins on the insides of the elbows. 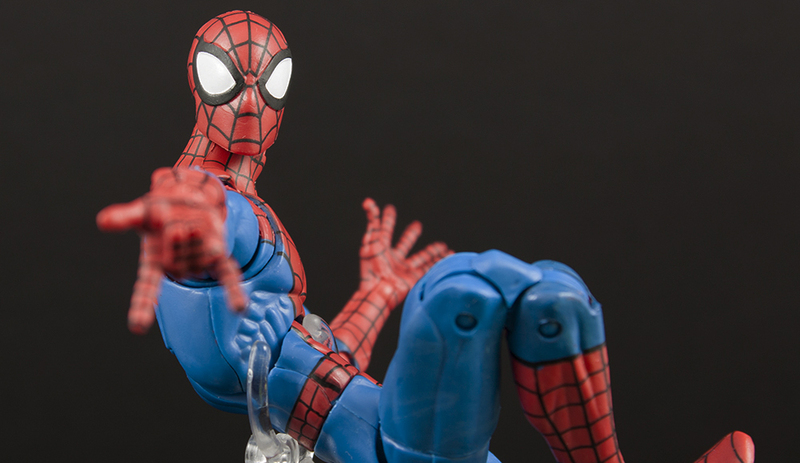 Would I recommend Hasbro Marvel Legends Vintage Series Spider-Man? Of course I do! Everyone should have a shot at owning this Spider-Man. It’s been a couple of years now since the original Pizza-Spidey release, and that figure’s price on the secondary market has also risen quite a bit. Now everybody has a fair shake at him again, and if you already own the original the new paint job, vintage packaging, and sausage on his pizza slice are all decent incentives to get this figure again. The vintage wave is showing up all over the place now. Spider-Man can be had over at Amazon, or check out Entertainment Earth if you are looking to buy a set.